Part of the problem is that many folk do not understand what a micro pub is, and how it differs from a normal pub. There is often a older clientele, shorter opening hours and no music, tv etc. Beer and cider are the order of the day, some offer wine , but there is no top shelf, alco pops etc, micros really are very different from macros! In other words they are for discerning adults who want a decent beer in convivial company. I just hope that we do not get too many of them so some end up struggling to make ends meet. I suspect that a local busybody has put the frighteners on others, getting them to put protest letters in. I wouldn't be bothered if they opened one next door to me. That is indeed the case, Howard. Many of the letters were photocopied and then individually signed. I don't know whether the motivation is personal antipathy or ignorant nimbyism. Because the overheads involved in running micropubs are so small, they only need a modest amount of trade to succeed. Many are run by couples where one partner has another full time job, you can't do that with a large pub. They are therefore more of a threat to the traditional pubs than to each other. I can foresee a time when most towns the size of Dover just have a Wetherspoons and about 20 micros. Totally agree Peter, Wetherspoons have an excellent business model starting with breakfast through morning coffee, afternoon tea, then evening meal and with a wide choice of beverages. Independent pubs cannot compete. Micro pubs will take up the slack with plenty of opportunities in Dover, I don't think that apart from the Malvern there is a pub from Dover Priory through to the outskirts of Capel, I would have thought a micro pub would do well somewhere in Maxton. From the Priory Hotel, there's one in Elms Vale, (Crown & Sceptre), one in Eaton Road (Boar's Head), then the Plough beyond Farthingloe, the Royal Oak, Valiant Sailor and Lighthouse at Capel, then Folkestone. Most leased or tenanted pubs change hands with regularity, indicating that the pubco business model seems to have morphed from running successful boozers to relieving a succession of naive and starry-eyed new entrants to the trade of their life savings. There's a sign outside the Royal Oak saying that it's under new management. A little bird has told me that the ' Lanes' micro is going ahead and should open before christmas. It goes to licensing committee on 24 Nov and to the Dec planning committee at both of which I shall be appearing to speak on behalf of the applicant. Opening before Christmas might require a finesse of the legal niceties. I need reminding where the "Lanes" is sited. Worthington st, on the corner of Queens Gardens, the old penny arcade. The Lanes (Debra & Keith) received approval of their licence application yesterday at a licensing sub-committee meeting. Next hurdle is planning committee. The planning officer is now asking how thick the vinyl frosting on the windows is going to be and whether it is transparent or not. Electrical contractors were in today installing lighting. 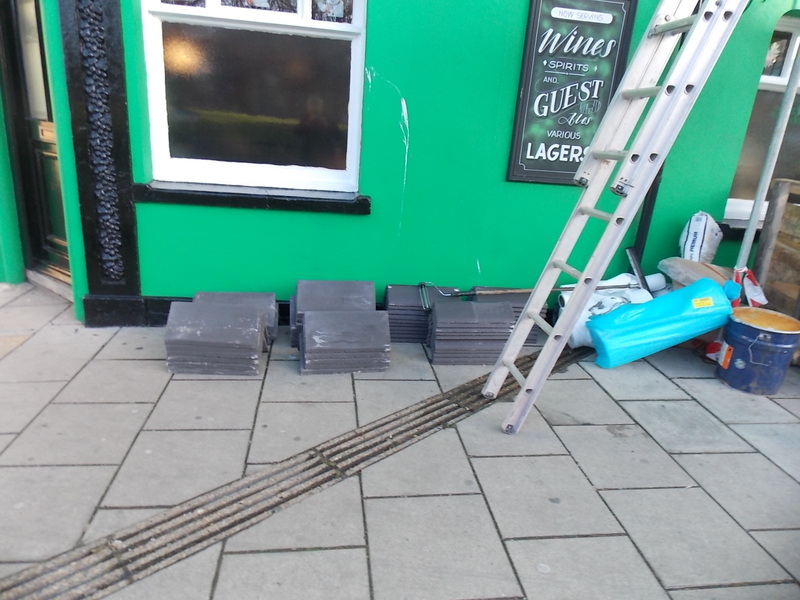 The Golden Lion seems to have sprung a leak, tiles/slates on the roof were being stripped down earlier. being put back now,looks like it needed a new roof. Still working on it 6 days later. Planning application to convert The Hope in Lydden to residential use goes before Planning Committee on 18th December, following recommendation for approval in a report by outside planning consultants based in London (how much did that cost!) as DDC planning we were told are too busy. 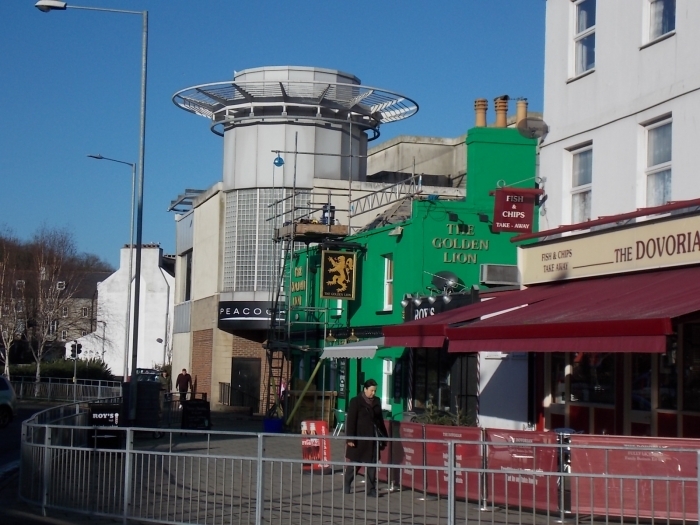 The design approved in 2010 almost foresaw the micropub revolution in East Kent but it closed in 2011, and in spite of the partial demolition (referred to as the 'side extension' in the application but actually the main bar and the oldest part of the pub) and much building activity has never reopened. Lydden Parish Council and several others have opposed. Interesting item on Newsroom South East this evening focusing on the recently opened "Lanes" but described East Kent as the hub for micropubs with 29 in all. Visited my first micro pub last Saturday evening 'The Mash Tun', excellent range of beverages, great cosy atmosphere, had an interesting chat with Nigel Collor and met-up with a drinking companion of mine from 35 plus years ago - Alan Plant. A great evening, I look forward to many more 'sessions', on my frequent revisits to the town. Ah so that was you, Ian. Can't guarantee you will always bump into old drinking buddies but you will always be welcome.